The day after the NFL came down with a ruling that they are upholding the 4 game suspension for Tom Brady, the owner of the Patriots came to the defense of Tom Brady. Robert Kraft surprised reporters who were expecting head coach Bill Belichick to address the Tom Brady penalty. Kraft took the podium and went on a ten minute tirade against the commissioner and the NFL as a whole. The NFL commissioner says the 4 game suspension will stand, even after hearing Tom Brady at length defend himself. It appears the sticking point for the NFL is that they requested certain information from Tom Brady’s phone, one that Brady says he has since destroyed since his attorney told him it was no longer needed. The commissioner appears to have a problem with Brady being uncooperative, after requesting to only see text messages that pertained to this case and not his phone. Brady claims he was not about to give up his phone because of personal information. Kraft was angry at the podium because he says he took the harshest punishment in NFL history, expecting the league to go easy on Brady. They did no such thing. Now Kraft regrets the deal and wishes he could change his mind and fight alongside Tom Brady. The damage is done, and this appears to be going to a new court of appeals and could drag on several weeks or months more. 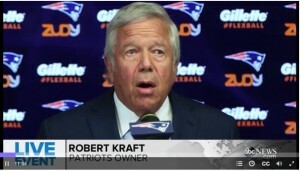 One thing is for sure, Kraft is not happy with his former friend in the commissioners office. It might have taken 6 months, but Tom Brady finally spoke out about his 4 game suspension handed down by the commissioner of the NFL. Tom Brady, star quarterback for the New England Patriots, took to his Facebook page to tell the world exactly what he feels about and how he is going to proceed from here. The tone of the message was strong, and appeared as if written by an attorney more than a man fighting to restore his image. Brady wrote a scathing message to the NFL claiming that not only is he innocent, that the NFL is on a witch hunt and making claims that simply are not true. Brady claims that the NFL announced he destroyed a cell phone to hide evidence, Brady says he simply replaced a broken phone. Brady went on to say that not only did he do nothing wrong, his harsh sentence is unfair considering that the NFL has zero evidence showing he did anything wrong. Brady simply is saying that he is being punished for a crime that there is no rules or regulations for. The reason many are not impressed with Brady’s message is that he waited too long to finally defend himself. Had Brady been this adamant when he was first accused of wrong doing, maybe he would have gotten more support and this issue would have gone away. Instead, Brady is now in the fight of his life to try and restore a reputation that is getting more tarnished as this drags on. Tomorrow, the League and the NFLPA have to meet with Judge Richard Berman to discuss any possible settlement that may have been agreed upon leading up to the Wednesday conference. Reports indicate that the League is taking this order from Judge Berman seriously and discussions are ongoing.